Nusa Dua. The financial burden placed on Indonesian state-controlled companies to develop infrastructure could result in higher fiscal risks for the government, the Organization for Economic Cooperation and Development said. In an economic report on Indonesia published on Wednesday, the OECD said the presence of Indonesian state-owned enterprises across the economy is more extensive than any other country it monitors, except for China. Debt taken on by these companies to finance infrastructure projects could expose them to cash-flow constraints, "particularly if interest rates increase or projects are delayed," according to the report. "Recognized contingent liabilities were only 0.01 percent of GDP in 2017, as these are confined to government guaranteed loans. But the potential need for capital injections represents an indirect fiscal risk," the report said. 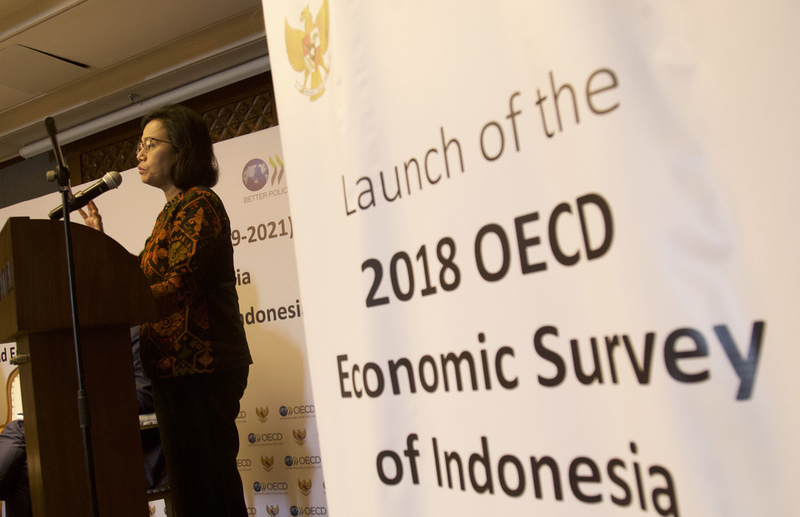 The OECD released its report on the sidelines of the 2018 Annual Meetings of the International Monetary Fund and the World Bank Group being hosted by Indonesia in Nusa Dua, Bali. The report said government policies to keep fuel and electricity prices unchanged despite higher global oil prices have also prevented some firms from passing on rising costs onto customers, hurting their balance sheets. State utility Perusahaan Listrik Negara (PLN) recorded a net loss of Rp 5.3 trillion ($362 million) in the first half of this year due to the rupiah's slump. If it books losses this year, it would be the first time since 2013. State energy firm Pertamina's first-half profit was its lowest in four years. The government is awaiting legislative approval for its proposal to inject Rp 17.8 trillion in capital to three state-owned enterprises next year, including Rp 10 trillion to PLN. Earlier this year, ratings agency Standard & Poor's said the leveraging level of 20 listed and rated state-owned enterprises has increased to around an average of 5 times debt-to-EBITDA, jumping from 1 time in 2011. Ensuring good governance and more transparency are crucial to improving the condition of Indonesia's state-owned enterprises, the OECD said, while the government should allow more private sector participation in infrastructure development. The government has pushed state infrastructure developers to diversify funding source from debt to equity-based financing to help mitigate this risk. A dozen Indonesian state enterprises are expected to sign financing deals for infrastructure projects later this week.